With the HYPOXI-Method for a flat stomach! As per statistics, what do men see when standing in front of the mirror with a naked upper body? Lots of annoying pounds. For all who want to shape their stomach, HYPOXI offers asolution for those who want to shape their belly. Not surprisingly, the majority of the titles of fitness magazines for men, a super six-pack, which stands out from the background as if made of stone. Women admire a flat stomach and therefore the six-pack is priority no. 1 with men. However, those who do not consider the attraction aspect should also consider tightening the belt. As more and more studies and examinations show that excessive abdominal fat can be a risk factor and the cause of numerous illnesses such as heart attack or stroke. The disastrous fact is that the targeted removal of fat on the belly is a real problem. Many men are neither successful with sports nor with diets. Firstly,the body always removes fat where it is easily and quickly available. With men this is not the belly. This phenomena can often be observed with not fully trained body builders who despite having very defined arms and legs, still have love handles. Fat can only be transported through the bloodstream and used as a fuel.. Therefore: the better a body region is perfused with blood the easier fat can be removed from there. A permanently trained male upper arm is well supplied with blood, here fat isn’t stored easily. This is different in the abdominal area which nature sees as a storage area for hard times. In order to intensify the fat breakdown on the belly, the blood circulation has to be stimulated there. Exhausting sit-up sessions are now a thing of the past. The results achieved with HYPOXI’s Vacunaut are beyond those ever achieved with conventional cardio training. The series of chambers within the Vacunaut-PressureSuit apply alternating high and low pressure to the stomach area. This unique action significantly stimulates circulation in the problem area around the abdominals. 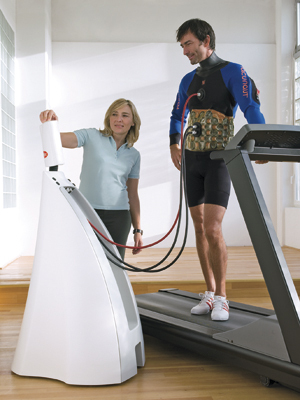 The HYPOXI-Method is applied during light cardio training undertaken on a treadmill. Through the unique combination of therapy and training, the Vacunaut literally burns the fat from the targeted stomach and hip region. For a flat stomach: Sign up for your free and non-binding HYPOXI test training!